Jihad Watch : An overflow of piety in The Hague. 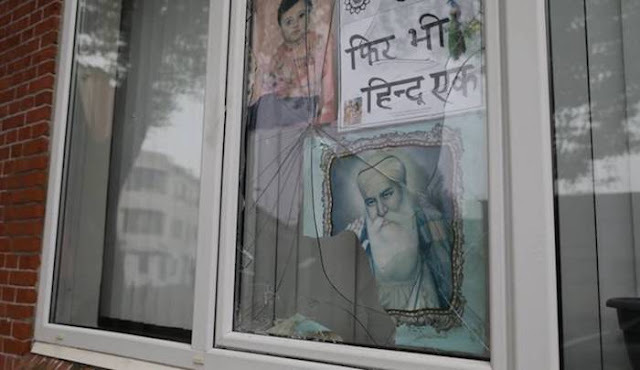 The windows of the Hindu temple in the Schilderswijk area of The Hague were broken last night. That happened a week ago, too. “Very sad,” says Radjin Ramdhani, an assistant in the temple. Mayor Pauline Krikke had direct contact with the temple board this morning. “I have offered my support,” she says. “This vandalism has to stop, and I have had extensive consultations with the police and ordered them to install camera surveillance at the temple as quickly as possible, and I hope that this will help restore peace and public order.” Same offenders as last week. Radjin Ramdhani hopes that the perpetrators will be found as soon as possible. “I expect them to be the same perpetrators, who may have felt emboldened after the incident last week, so they did it again,” he said to Omroep West. According to Ramdhani, it is the umpteenth time that the building and visitors are the target of vandalism. During prayer services that were held earlier in the garden, visitors were insulted and stones and bottles were thrown at their heads.